May the Lord answer you when you are in trouble! May the God of Jacob protect you! And give you aid from Mount Zion. And be pleased with all your sacrifices. And celebrate your triumph by praising our God. May the Lord answer all your requests. And by his power gives him great victories. Some trust in their war chariots and others in their horses. But we trust in the power of the Lord our God. O Lord, answer us when we call. Now Thomas (called the Twin), one of the twelve disciples, was not with them when Jesus came. So the other disciples told him, "We have seen the Lord!" A week later his disciples were in the house again, and Thomas was with them. Even though the doors were locked, Jesus came and stood among them and said, "Peace be with you!" Then he said to Thomas, "Put your finger here; see my hands. Reach out your hand and put it into my side. Stop doubting and believe." Then Jesus said to him, "Because you have seen me, you have believed; blessed are those who have not seen and yet have believed." Jesus did many other miraculous signs in the presence of his disciples, which are not recorded in this book. But these are written so that you may believe that Jesus is the Christ, the Son of God, and that by believing you may have life in his name. Arcana Coelestia #2568 Affirmative or negative? There are two basic mental attitudes, the first leading to complete foolishness and insanity, and the second leading to complete intelligence and wisdom. The first happens when we deny everything--meaning when we say in our heart that we cannot believe anything until we are convinced by things we can grasp mentally and perceive through our senses. This attitude leads to complete foolishness and insanity, and may be called "the negative attitude." The second happens when we consider affirmatively the various teachings that are drawn from the Bible--meaning when we think and believe within ourselves that they are true because the Lord has spoken them. This attitude leads to full intelligence and wisdom, and may be called "the affirmative attitude"
Today is Worldwide Communion Sunday. Along with Christians all over the world, we are celebrating a sacred meal that goes back nearly two thousand years, and even farther in its roots in the Jewish Passover. We have no eyewitnesses to give us firsthand information about how the Holy Supper began. 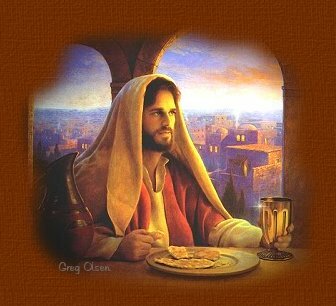 No one alive today was present when the Lord instituted this sacrament during his last supper with his disciples here on earth. Those who were present, and their children, grandchildren, and great-grandchildren, died many centuries ago. If that is so, how do we know these events really happened? We have only one real source of information: the Bible. In fact, the Bible is the only detailed source of information about most of the events it records. Other histories overlap with the Bible occasionally, but nowhere near enough to corroborate most of what is recorded in it. Archeology can tell us a great deal about the physical circumstances and the lifestyles of the people in Biblical times. But archeology paints only a general picture; it cannot tell us about the specific human interactions that make up the flow of the Bible story. It cannot say whether a particular man named Jesus existed, and whether a week and a half after the Last Supper this Jesus had a conversation with a man named Thomas about doubt and belief. Anyone of a skeptical mind can find all sorts of reasons to believe that most of the things in the Bible--especially those recorded in the New Testament--never happened at all. Of the four accounts that we have of Jesus' life, three of them, the Gospels of Matthew, Mark, and Luke, seem to be based on same source. Yet even these three disagree with each other on many significant details. The fourth, the Gospel of John, tells the story very differently than the other three, calling the whole narrative into question. And then there are all the amazing events the Gospel accounts ask us to believe--which, quite frankly, strain the credulity of the modern, rational mind: a child born with no human father; water changed into wine; miraculous healings; a man brought back to life after he had been dead four days; and finally, Jesus himself rising from the dead and coming back to have the conversation that we read from the Gospel of John. It all sounds like magic and fantasy, not like real historical events. Can we really believe in all these incredible things without any physical or scientific evidence to support our belief? The man who has become known as "Doubting Thomas" could not. He needed to see and touch Jesus in order to believe in him--even though Jesus had been with him for several years, teaching him so many things about God and spirit. If Thomas couldn't believe even though he had previously seen Jesus with his own eyes and heard his teachings with his own ears, can we really believe now, two thousand years later? Beyond that, can we believe in the existence of God and the spiritual world in an era when science and reason lay claim to being the only sure basis for a knowledge of truth? We have all faced this question at one time or another. Presumably, most of us here in church today have found a way to resolve it in favor of God and spirit, or we would not be here. Other people have not been able to get past the need for scientific and rational evidence, and have rejected God and spirit. Still others have not decided one way or the other; for these people, it is an ongoing question. We must each find our own answer to this question. I could not answer it for you in a full-length book, let alone in a sermon of a few pages. Unlike science, which strives for objectivity, our spiritual beliefs are intensely personal--so my answer would probably not work for you anyway. However, I can tell you about how I personally have faced this question, which may lead to some helpful thoughts as you or the ones you love face the same question. I recall very distinctly something that happened inside of me about the time I was leaving my parents' home and going off on my own. At that point in my life, I realized that I could either accept or reject everything I had ever been taught about the Lord, the Bible, and the spiritual world. And I knew that whichever way I decided to go, I would be able to come up with arguments to support the decision I had made. Whichever way I went, I would be able to convince myself more and more fully that I had made the right choice. As I faced this spiritual parting of the ways, I realized that science and knowledge could not make the decision for me. And I realized that even our highly prized human ability to reason could not make the decision, since my brain could go either way. In fact, I realized that my head could not make the decision at all. Rather, it was a decision that had to be made in my heart. And once my heart had made the decision, my head would follow. You see, science and reason are wonderful tools that have opened up a whole new world of capabilities and possibilities for us. But science and reason have often missed a very important point about human beings--about what we are made of and how we come to know and believe things. The point that they have often missed is that it is not just our mind and our experience that make us who and what we are, but our heart as well. Let's use an analogy from science and engineering. Heart, mind, and experience (or action) in human beings are like the three legs supporting a steel tower. When we rely only on our rational abilities and on knowledge that comes from experience, it is like trying to make the tower stand on only two legs; it will come crashing down because it does not have that third, vital leg to keep it balanced. That third leg, in human terms, is the experience and reality of our heart. We cannot make a decision about faith without consulting our heart as well as our rational mind and our outward experience. And it is only when our heart enters into it that we can begin to find an affirmative answer to the question, "Can we really believe in God and spirit?" As our teachings tell us, it is the attitude behind our mental abilities that will really make the decision within us. If we fall into a negative attitude, hardening our hearts so that we refuse to believe anything unless it is proven through physical evidence, then our hearts have already made the decision to deny and reject both God and our own deeper reality. But if we hold to an affirmative attitude in our hearts, we will find that the whole knotted tangle of negative, skeptical human argument simply falls away in the face of the deeper wisdom that comes from within, through our hearts, from the God of the universe. We will find that we do not need to see with our eyes and touch with our hands in order to believe what our heart tells us is true: that there is a God who loves us and cares for us--a God who speaks to us in the Bible, in nature, and in the people we see every day. And I pray that each of you may know that God personally, as our Lord and Savior Jesus Christ. Amen.